A long time ago, perhaps as long ago as the Stone Age, our ancestors discovered that mixing water with the ashes from the previous night's fire makes a good washing-up liquid. Not the solids, but what dissolves in the water forms a mildly caustic lye solution. It cleans dirty hands, and oily hair. The more concentrated the lye, the more pronounced the cleansing effect. When the solids are strained out and the liquid is evaporated, left behind is a crystalline salt known as potash. This process of extracting the soluble components of charred plant material is known as lixiviation. Potash had several applications in the ancient world that played a critical role in the advancement of civilization. Mix potash with tallow (rendered animal fat) and you have soap, spread it on your fields and you have a good fertilizer, put it in a very hot furnace with powdered sand, and you have glass. In simple everyday human activity, we see the roots of modern chemistry. The English word ‘potash’ is derived directly from the process described above: made in a pot with plant ash. It lends its name to the chemical element potassium, a major constituent and a key ingredient for many glass recipes. Besides potassium, plant ash can also contain significant quantities of sodium, magnesium and calcium. They occur in different amounts depending on the species and on its habitat. Plants are literally composed of the nutrients in the soil from which they grow. Mineral compounds that dissolve in water are brought in through the roots and become part of the plant. In northern European forests, salt from the ash of oak and beech trees and fern plants was used for potassium glass as far back as the middle ages. In the more arid Mediterranean regions, scrub vegetation from the coastal marshes made both sodium and potassium glass, namely with the soda and kali plants. The soda plant lends its name to sodium and the kali plant lends its name to a group of chemical elements, which we now call the alkali group. 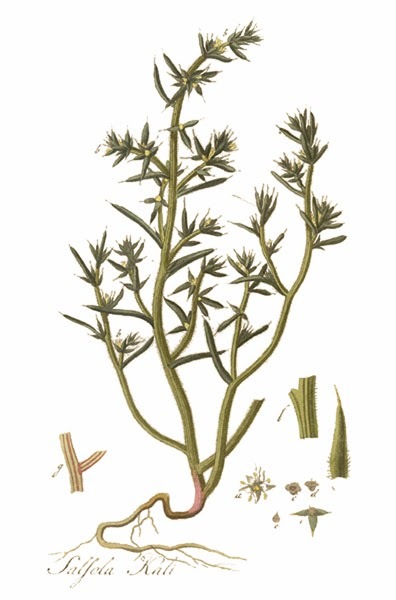 Of these two plants, salsola soda is high in sodium and very low in potassium, salsola kali is more equal between the two. The high sodium carbonate content of the soda plant and a few other species is unusual, but soda accounts for most glass made, even today. Most other plants are potassium rich. To make glass, the material was lixiviated: boiled, filtered, purified and dried. The raw plant material was lightly charred to reduce moisture content; this prevented rotting and reduced volume and weight significantly for shipping. 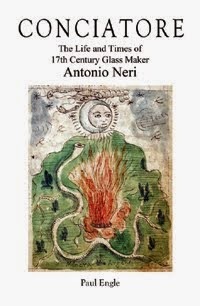 Neri experimented with the ash of many other plants as well and he does not hesitate to mix salt from different sources to achieve a desired effect. He found suitable glass salts can be made from ferns, blackberries, broad bean (fava) husks, cabbage, thorn bushes, millet, rush and marsh reeds. What Neri did not know was that virtually all of these plants produced a salt that was heavily laden with potassium. Potash glass has a fundamentally different character than soda glass. He knew quite well that fern glass had a different workability and appearance from soda glass, but he was over a century too early to understand why. Highly purified, potash glass sparkles in the light more than soda glass. It is denser, giving better refraction of light, yet it is also more difficult to work since it stiffens quickly on the blowpipe. * This post first appeared here on 29 September 2014.